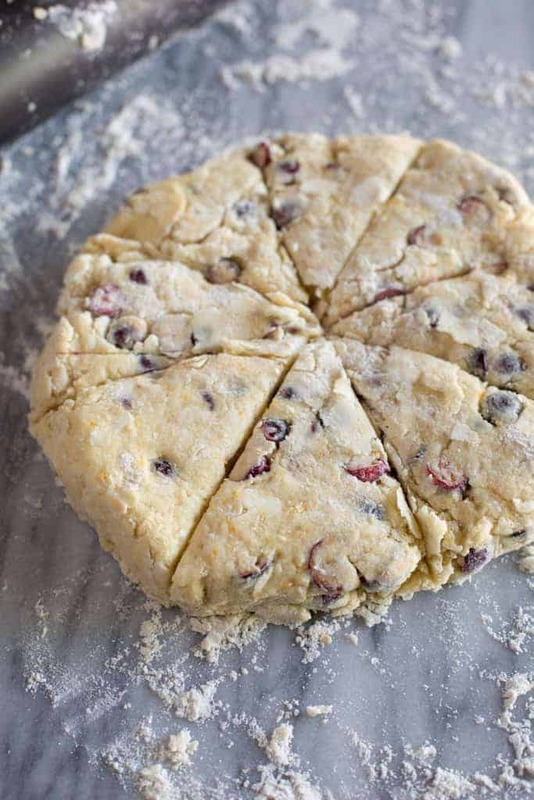 We love these festive and easy Cranberry Orange Scones during the holiday season! They’re slightly crisp and flakey on the outside with a light and moist center and delicious bursts of cranberry and orange flavor. My mom used to make scones fairly often on Sunday morning before church. She’d usually bring a batch for the youth she taught during Sunday school, and we got the extras! She was well known for her delicious scones, and because of her, I developed a love for them at a young age. 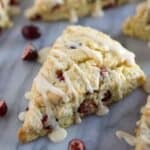 Cranberry orange scones are so perfect for the holidays, and there’s something about that flavor combination that I always crave this time of year (although you can use frozen or dried cranberries and make them any time of year!). Scones are so EASY to make but I do have a few tips that are really essential if you want to bake absolutely perfect homemade scones. Use frozen butter. Frozen butter will help ensure the dough stays cold before baking the scones. As the butter bakes it creates pockets of air which yield the tender, moist center we want from a perfectly baked scone, with a flakey and crisp outer layer. If the dough or butter is too warm when you bake the scones they will spread more and wont puff up like you want them to. For best results, place a stick of butter in the fridge about 30 minutes before making the scones. Then use a box grater to grate the frozen butter into the flour mixture, in step 2 of the recipe. Don’t overwork the dough. Just like when making homemade biscuits or pie crust, you don’t want to handle or knead the dough more than necessary because the more you mix it, the tougher your scones will be. How long do scones last? Scones are best served fresh, warm from the oven, but leftover scones can be stored at room temperature or in the fridge for up to two days. You can also freeze the scones after they have cooled, without the glaze. Freeze in an airtight container or ziplock bag for up to 3 months. 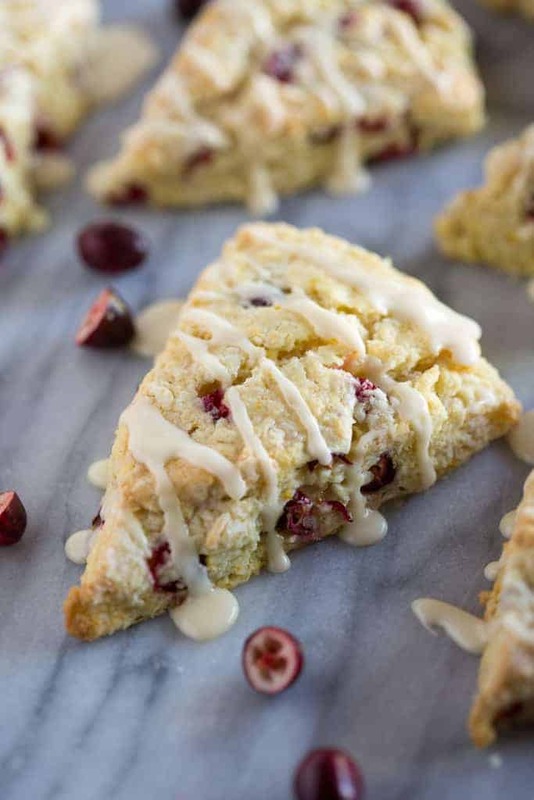 We love these festive and easy Cranberry Orange Scones during the holiday season! They're slightly crisp and flakey on the outside with a light and moist center and delicious bursts of cranberry and orange flavor. In a large bowl whisk together the flour, sugar, baking powder and salt. 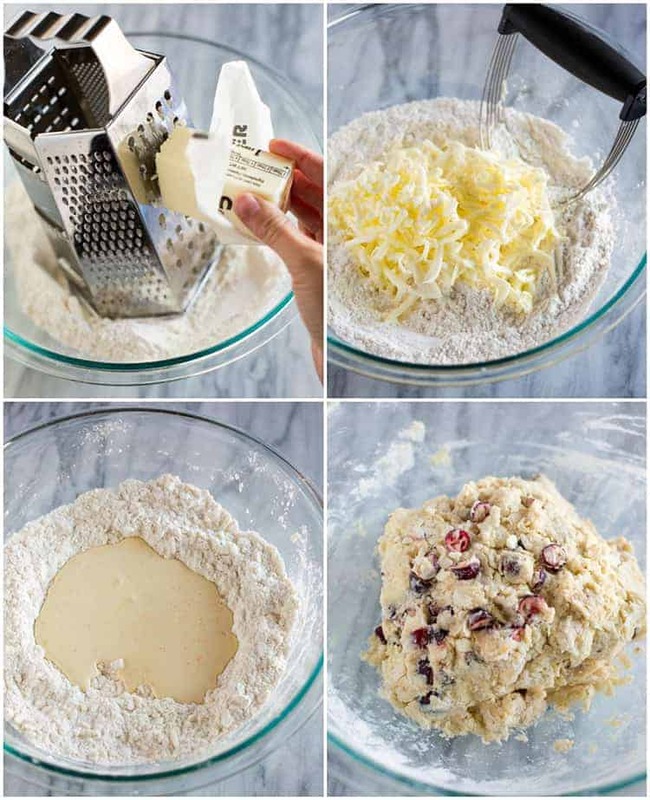 Grate the frozen butter into the bowl and use a pastry blender or fork to combine the flour and butter until it resembles coarse meal. Stick the flour mixture in the fridge while you combine the wet ingredients. In a small bowl combine the sour cream, heavy cream, egg, vanilla extract and orange zest. Pour it over the flour mixture and gently stir to combine, just until everything is moistened. Fold in the cranberries. Flour or grease your hands and then gently work the dough together and pour it out onto a floured surface. Press the dough (or use a rolling pin to gently roll it) into a circle about 1 inch thick. Cut the dough into 8 wedges. Place the scones on your baking sheet and brush the tops of them with a little bit of heavy cream. Bake for 15-18 minutes, until golden. Remove scones from the hot baking sheet and allow them to cool for at least 10 minutes before drizzling the glaze on top. To make the glaze, combine the powdered sugar and freshly squeezed orange juice and stir together until smooth. Add a little more orange juice or powdered sugar until you reach your desired thickness to drizzle over the scones. Your scones sound delicious and I can’t wait to try them. Do Craisins qualify as a dried cranberry (because I see on the package that they are sweetened)? is it okay to mix 1/4 cup of butter with 3/4 cup of whole Lactaid to make the heavy cream needed in this recipe??? I’ve never baked with lactaid so I can’t say, sorry! I just made these this morning and my husband and I are hooked. They are so delicious and moist, and the best scone I’ve eaten. Thank you so much for your recipe. It’s definitely a keeper.